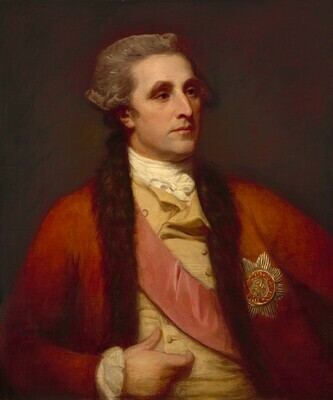 Noted as given by the sitter in 1789 to his nephew, the Hon. Charles Francis Greville [1749-1809]; (sale, Christie, Manson & Woods, London, 31 March 1810, no. 41); probably bought on behalf of the Hon. Robert Fulke Greville [1751-1824], brother of Charles Francis Greville; bequest to his wife, Louisa, Countess of Mansfield [d. 1843]; by inheritance to their daughter, Lady Louisa Greville [d. 1883], wife of the Reverend the Hon. Daniel Hatton [1795-1866], rector of Great Weldon and chaplain to the queen; by descent to Nigel Hatton [1859-1937]. (Asher Wertheimer, London), by 1917; sold 1917 to (M. Knoedler & Co., London and New York); purchased 1918 by Andrew W. Mellon, Pittsburgh and Washington, D.C.; gift by 1937 to his daughter, Ailsa Mellon Bruce [1901-1969), New York; bequest 1970 to NGA. According to a Knoedler prospectus dated 26 April 1913 given to Andrew Mellon, Sir William gave the portrait to his nephew on 8 May 1789. Christie's marked copy of the catalogue records no. 41 as bought by "Col. Greville." Robert Fulke's son, also named Robert Fulke, was a captain; possibly he acted as buyer for his father, and was recorded as "Col."
 M. Knoedler & Co. records, recorded by The Provenance Index, J. Paul Getty Trust, Los Angeles, California. Vases and Volcanoes: Sir William Hamilton and His Collection, The British Museum, London, 1996, no. 8, repro. "Designs from Fancy": George Romney's Shakespearean Drawings, The Folger Shakespeare Library, Washington, D.C., 1998-1999, no. 11. Pompeii and the Roman Villa: Art and Culture around the Bay of Naples, National Gallery of Art, Washington, D.C.; Los Angeles County Museum of Art, 2008-2009, no. 118, repro. (shown only in Washington). The medium-weight canvas is twill woven; it has been lined. The ground is a light pinkish red, of moderate thickness. The painting is broadly executed in fairly thin, opaque layers with transparent red and brown glazes in the shadows. The glazes have been abraded. The moderately thick natural resin varnish has discolored yellow to a significant degree. Public Advertiser, 13 April 1785. Ward, Humphry and William Roberts. Romney. 2 vols. London, 1904: 1:103; 2:69-70. Walker, John. National Gallery of Art, Washington. New York, 1975: no. 512, color repro. Walker, John. National Gallery of Art, Washington. Rev. ed. New York, 1984: 365, no. 510. colo repro. Hayes, John. British Paintings of the Sixteenth through Nineteenth Centuries. The Collections of the National Gallery of Art Systematic Catalogue. Washington, D.C., 1992: 239-240, repro. 239.